After the Federal Reserve’s announcement to engage in more quantitative easing, the Republican Party neglected to hide its cynicism and now openly complains that the Ben Bernanke is trying to boost the economy. The GOP argues that the Fed Chairman shouldn’t be fulfilling the second half of his dual mandate to seek maximum employment because that might help Obama win reelection. Sen. John Cornyn, R-Texas, said Bernanke is “trying to juice the economy” before the Nov. 6 election, and it “looks to be political,” notes the website This Week. All these criticisms either implicitly or explicitly acknowledge that the Fed’s actions might improve the economy, yet they don’t want that to happen because it’d help the political prospects of their opponent. If anyone had any doubts, the GOP cares more about winning elections than helping the unemployed and struggling businesses. Mitt Romney apparently believes that only tax cuts tilted toward the wealthiest Americans can really help the economy, everything else is “artificial and ineffective.” It’s tough to understand what the problem with “artificial” economic growth is. If it lowers unemployment and increases production those are tangible benefits in real people’s lives and businesses’ profits that we’re in no position to dismiss. The conservative tradition in this country wasn’t always so purely cynical or married to the economic fringes. They once recognized that presidents and politicians weren’t the only determining factor for the state of the economy and that monetary policy may be the single most important policy tool for economic management. Today, the mainstream of the conservative movement regards cutting top marginal tax rates as the real and effective means to growth. Others -the ones that liberals favor – are imposters. If only it were as easy as cutting taxes; unfortunately, a complex global economic system doesn’t match up with the 1 dimensional fiction Republicans treat as textbook. 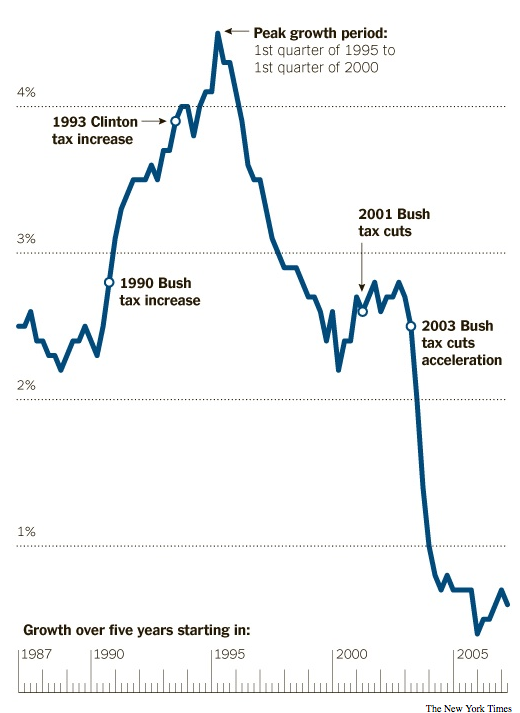 Turns out, tax cuts hardly matter at all in determining growth – especially when they’re already at historic lows. At the level of taxes we’ve been at the last couple decades and the magnitude of the changes we’ve had, it’s hard to make the argument that tax rates have a big effect on economic growth,” Mr. [Donald] Marron [Tax Policy Center director and former Bush administration official] said. Similarly, a new report from the nonpartisan Congressional Research Service found that, over the past 65 years, changes in the top tax rate “do not appear correlated with economic growth. The Fed has a duty to foster the conditions suitable for growth. Ben Bernanke doesn’t set tax policy, trade policy, or fiscal policy – he and his board of governors set monetary policy. After 43 months of unemployment above 8 percent along with research showing that previous monetary easing created millions of jobs and with evidence-based theory suggesting that altering future expectations with an open-ended commitment to easy money improves growth, both parties should be encouraging the Fed to do whatever it can to get us back to full employment as soon as possible. Mr. Romney, are the very rich better off today than 4 years ago? Who is responsible for their continued good fortune? Are you better off than 4 years ago?